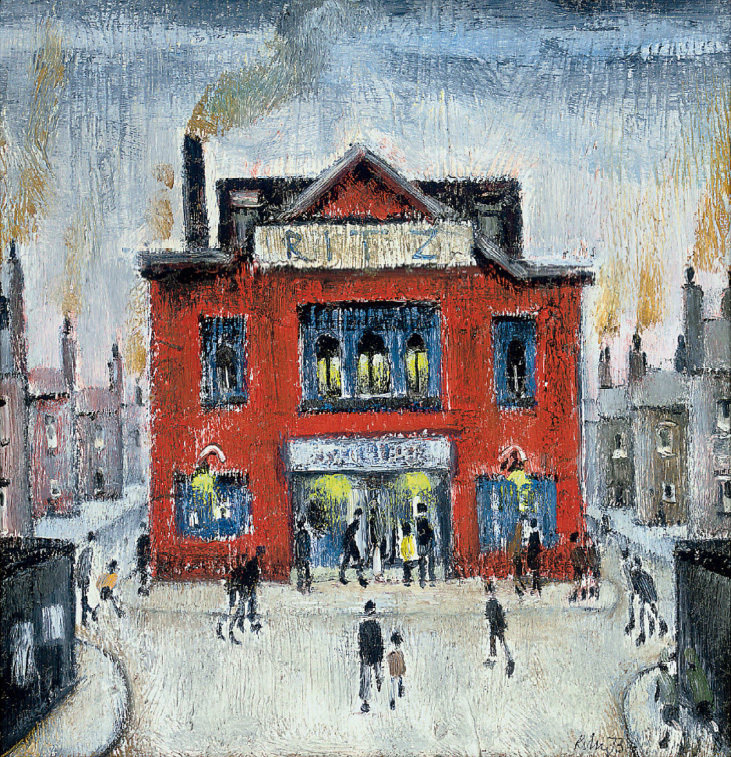 One thing about L. S. Lowry’s (1887-1976) technique is his limited palette: black, vermillion, prussian blue, yellow ochre, and white. So, no bright yellow, no bright green, or cobalt blue for a start. Apart from the recognisable drawing and subjects, this limited palette gives his paintings a characteristic color as well. This simplification of technique can help an artist to focus on other aspects of the work. 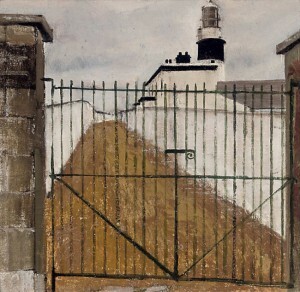 These two paintings by Harold Riley (1934-) look like Lowry’s. They have a similar style and subject. However, the color looks a bit different because he uses a greater range of colors and in these two paintings, bright yellow is the stand out. 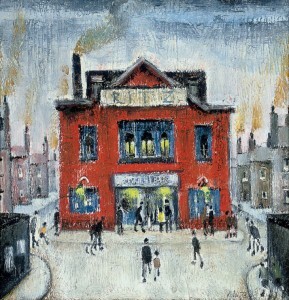 Riley was a student and friend of Lowry. Riley also claims that Lowry painted the shoes in the Balloon Seller. 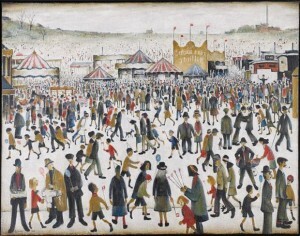 Here are more artists that look a bit like Lowry with similar sentiment elements. Another reason they look related might be just the naive aspect of the work. Also, apart from Riley, who is a bit younger, all these British artists lived through similar times. Although I felt there was a general drop off in the quality of the aesthetic element in these works, and initially preferring the work of Joan Gillcrest, I find the painting by Helen Bradley an interesting case as it has grown on me. Despite Bradley’s painting initially looking clumsy, the sentiment element is so strong that it compensates for this weakness. 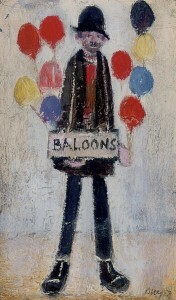 Maybe this sums up the general quality and appeal of good naive painting. SIR Alex Ferguson lost out to a Blue when he tried to make his latest signing. 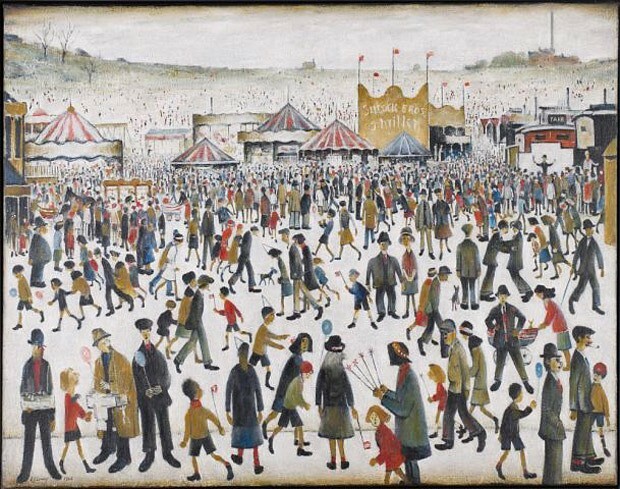 The United manager bid £14,000 for a `new’ LS Lowry painting. 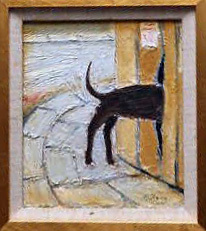 But life-long City fan and millionaire businesswoman Carole Nash landed the small painting of a curious dog. 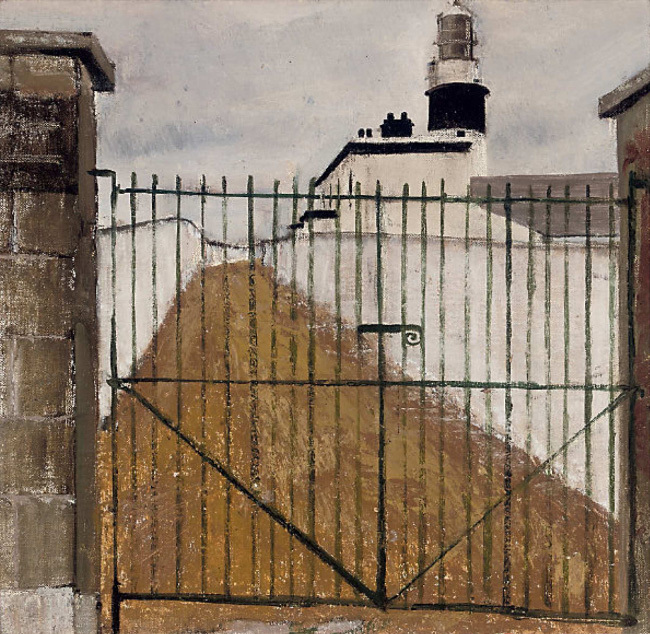 The work, started by Lowry – who died in 1976 – but later finished by his friend Harold Riley, sold for £23,000. It went under the hammer at a dinner and auction at the Lowry Hotel in Salford. The event, attended by 150 £100-a-head guests from industry, showbiz and football, raised £47,000 for Manchester’s New Children’s Hospital Appeal. The evening, called A Dog’s Dinner, was also promoting a limited-edition book called The Dog, published for the appeal. 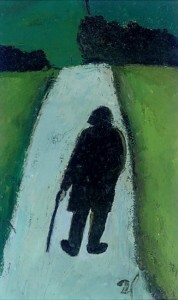 A lithograph of Lowry walking across Swinton Moss by Mr Riley was sold for £16,000. The appeal aims to raise £20m to provide equipment for diagnosis of children at a new hospital currently being built. It will replace Booth Hall Children’s Hospital and the Royal Manchester Children’s Hospital at Pendlebury. Hi Muriel, Thankyou very much for your information. I’m very sorry about the delay with this reply. 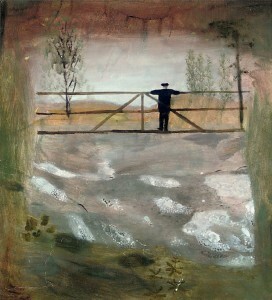 I haven’t been able to find any reference to the painting you mention but am keen to see it and will keep an eye out. It is very possibly still in the possession of the Tom Bergin family and will only come to light for the rest of us if the family put it up for sale or want to promote it and exhibit it. Can you tell me is your copy a painting and who executed it, and do you have a photo of it? Regards, Des. I wonder if you could tell me if a painting started by Lowry in 1972 and finished by Riley because of Lowry’s ill health has ever come to light? It is of the Salford City Reporter office and shows the paperboys, still in school uniform running out of the offices in Liverpool Street with the Salford City Reporters under their arms? 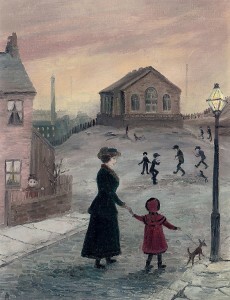 The painting was done by Lowry as a gift for Tom Bergin, editor of the Salford City Reporter, and friend of Lowry, to be given to him on his retirement. 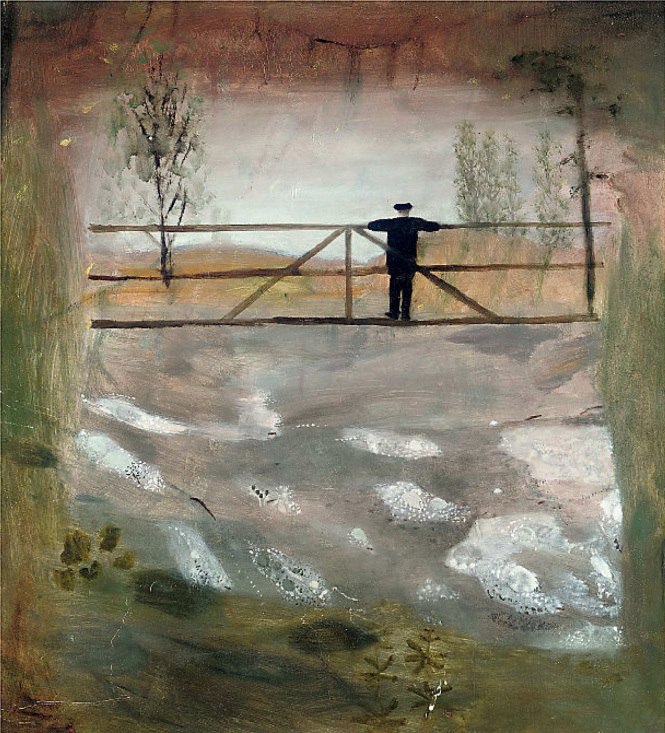 Tom had, from memory, six copies of the painting madeto give to people who had helped him keep the SCR alive – I was lucky enough to be one of them, but I would love to be able to see the original painting again if it is being exhibited anywhere.